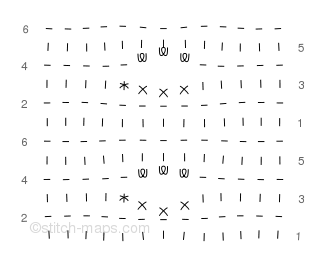 A simple example of using “CO” and “BO” within a stitch pattern. Shown with a cast-on count of 13 stitches. Rows 2 and 6: Knit. Row 3: K5, BO 3 sts, k4 (10 sts). Row 4: K5, CO 3 sts, k5 (13 sts).